I've spent a lot of time both studying and thinking about religion, theology and "the big questions" almost all my life and have come to the conclusion that there probably is no god and I just thought I would share some of my reasoning for coming to this conclusion. First of all with our current understanding of quantum physics we actually have a pretty consistent idea of how the universe works. Even though it is by no means complete, it does in it contain ideas about how the universe was at one point created out of nothing. It is often referred to as the ultimate free lunch. Granted to understand this discussion it requires a basic understanding of how the universe works, but it isn't really past what most people can get if they are interested in it. I recommend two courses from The Teaching Company. The first one is called Understanding the Universe: An Introduction to Astronomy and the second one is called Particle Physics for Non-Physicists: A Tour of the Microcosmos. 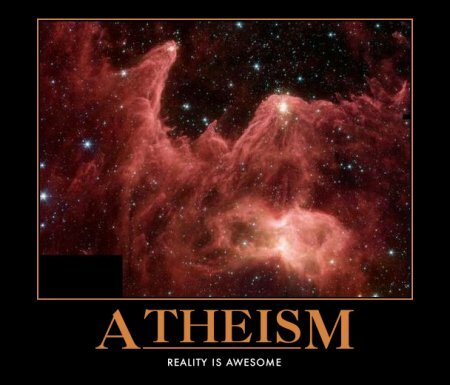 So with the knowledge that the universe can exist as we perceive it today without a god. Then the nonexistance of god comes from the application of Occam's razor which roughly states that the simplest solution to a problem is probably the right one. Another way to come to the same conclusion is to consider that the universe is probably around 4.5 billion years old. Humans have existed in more or less their current form for around 200 thousand years and no currently existing religion has been around for more than maybe 5000 years. Also factor in the size of the known universe and the pretty high likelihood of there being other intelligent life in it. It just seems so unlikely that a deity would go through all that trouble just to start nitpicking about what we eat, how we procreate and what we should think about others (Especially others who don't share our beliefs). Compare both of these arguments to the likelihood of religion being a human invention to help people to cope with the fear of dying, relatives passing away or an otherwise unfair lot in life. Then there are also the huge benefits that seem to generally be bestowed upon those that successfully start or become the leader of religions. And you also have the benefit that in most countries religions are not even taxed on their earnings or holdings. So if you are interested in being wealthy or to have power religion seems to be a great business to be in. This does not mean that I think that people who have come to different conclusions for these questions than me are stupid. These questions are almost by definition ineffable and unknowable. However given the fact that most people does seem to inherit their religion from their parents, it seem like they don't think that much about the alternatives.